Happy Summer Solstice everyone! I have a secret that needs to come out; despite being a total nature lover, I find summer is the most difficult season to love. There, I said it. Every June I come up with dozens of ideas for outdoor projects, ignoring Mother Nature’s gentle reminder which I vaguely recognize from last June, “You might want to do your outdoor activities during the coolest parts of the day & rest when the sun is at its highest.” When I continue to work in the yard, despite her warning, she gets parental by shrugging & saying, “Ok, I tried to warn you. Now you have to learn the hard way.” The reward for my stubbornness is exhaustion, icky sweat, & sunburn. As I rub aloe across my red shoulders & down my red nose, I humbly remember I need to work on Nature’s terms if I want to enjoy the summer. Lawnchairs in the shade beckon as the temperature climbs. 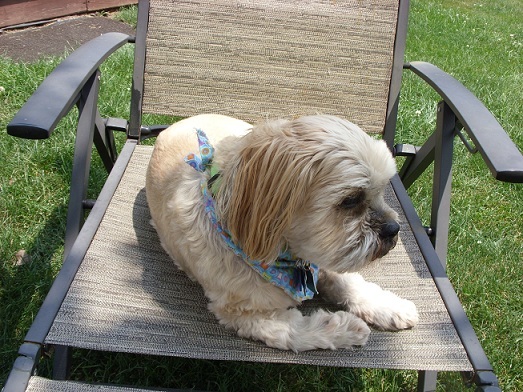 Paco, my Lhaso Apso, knows how to beat the heat. This entry was posted in My Love for Nature and tagged balance, earth, joy, life, nature, play, relaxation, summer, work by puresusan. Bookmark the permalink.